With all the intercity miles in Canada done, I turned my attention to the one piece of rail that I truly always wanted to ride in that country, the Canadian Pacific mainline between Vancouver and Calgary. 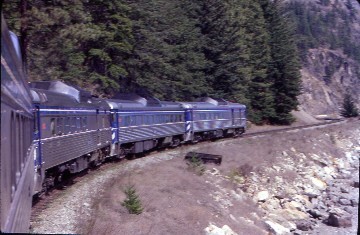 The Rocky Mountaineer gives the traveler two route destination options, Jasper on the CN Line that the Via Canadian runs over or Banff/Calgary on CP Rail. I wanted the most mileage for the money so one simple phone call got me a Red Leaf coach ticket roundtrip to Calgary from Vancouver. I cashed in some of my Alaska Airline Miles I earned riding Amtrak for a round trip Sleeper from Los Angeles to Seattle. 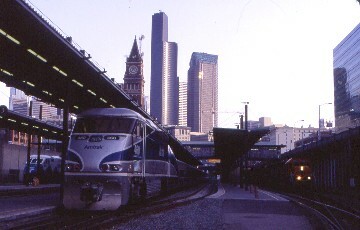 I bought a Seattle to Vancouver round trip with a Talgo north and the bus south. 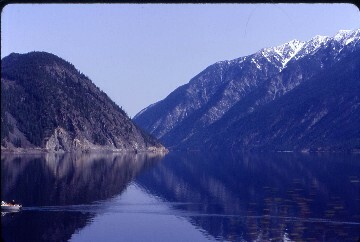 Finally, I bought a round trip ticket North Vancouver to Lillooet on BC Rail to reclaim that route for my sobriety after which all I had to do was live, work and ride trains until the day arrived to leave. 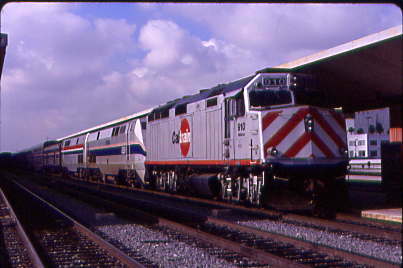 My mother dropped me off at the Santa Ana Amtrak Station so I could start the trip off with a short trip to San Juan Capistrano on Amtrak Surfliner 566 and meet Surfliner 769 to take me to Los Angeles so I could visit longer with Bruce Telfer the LSA on that train. That was my plan at least. Surfliner 769 was running right on time but Surfliner 566 was running an hour late. With a SJC to LAX ticket to be used, I decided to take Metrolink to Irvine to kill time so I could also have a maple bar there. It arrived in Irvine on time and I enjoyed my maple bar on the Irvine station platform in the bright California morning sun. I rode from Irvine to Los Angeles in a California Cafe Car talking with Bruce the whole way to LA. The only delay was a missing crossing gate at McFadden Ave. (I just can not get away from the McFadden name) which did not stop us from arriving in Los Angeles ten minutes early. Bruce wished me well on my trip and with the Coast Starlight not yet in the station, I patiently enjoyed more of our wonderful California sunshine. As the Starlight backed in, I noticed a Caltrain locomotive on the point so I walked down for a picture before I settled in to Room 3 in the 1432 car and decorated the room's window with the articles about me from the Honolulu Advertiser and the OC Register which run locally and in other places like San Diego, Palm Springs, Monterey CA, Houston TX and Myrtle Beach SC to name a few. I also put up a copy of the first page of my new web site with a map of where I have traveled by rail on it. Everything was proceeding nicely on Day 2276 of my sobriety with the Starlight ready to depart for Seattle. We pulled out of Los Angeles without our connecting passengers from the Southwest Chief who would be joining us at Martinez due to Train 3 lateness. I was relaxed and ready to be taken to Seattle. I enjoyed a beef burger and Turtle ice cream cake for lunch, took a nap with the inland side room and took the Union Pacific track maintenance in stride. Dinner was the Coastal Classic Pork Chops which came around right after Salinas and I watched the History's Channel program on Streamliners in the Parlor Car Theater. At San Jose the Caltrain loco came off and after I had fallen asleep, three roadrailers were added to the rear of our train in Oakland. I slept very soundly all the way to Dunsmuir where we arrived two hours late after a freight train had to set out a car with flat wheels which delayed our progress in the night. April 13, 2001 Our tardiness gave me an excellent view of the upper Sacramento River Canyon. So in every negative there can always be something positive found. Weather wise the low clouds were effectively blocking the view of Mt. Shasta and Black Butte. I enjoyed a nice breakfast with a family who was going on the Empire Builder. We got stopped at Andesite by a freight train with a light snow falling. I am so glad to be sitting inside the nice warm train while wearing my usual shorts. Once on the move again, the Starlight sprinted to Klamath Falls where I took a much needed fresh air stop out in the very cold mid April morning air. 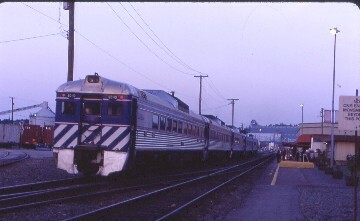 We were now late enough that our connecting passengers for the Empire Builder were taken off at K Falls and bussed to Bingen-White Salmon, WA to make their train. The family I had breakfast with had been bused to Martinez yesterday were not too happy about being bussed again and I could perfectly understand why. They had paid for a train trip not a bus trip so I made sure to tell them to call Amtrak for a Service Guarantee Certificate for all the trouble that they had been put through on their vacation. We left Klamath Falls and about an hour later I enjoyed a leisurely lunch before the Starlight crossed the snowy landscape of Cascade Summit. I watched a private showing of an SP film, Daylights along the Padre Trail as the train approached Eugene for another fresh air stop. Prime Rib and a Turtle was dinner as the Starlight proceeded up the Willamette Valley. Following a brief fresh air stop at Portland, I watched Chicken Run before I returned to my room to listen to music for the final hours into Seattle where we arrived three hours late. It was a quick cab ride to the King's Inn and a hot shower before I called it a night. Since I was only traveling to Vancouver one way by rail, on this trip I decided to do Business Class to enjoy a more comfortable trip to Vancouver so I could get off the train and through Canadian Customs first. My Talgo was the one built for the Los Angeles to Las Vegas service which still has not started due to problems in getting a second track built over Cima Hill caused by the Desert Tortoise population there. This Talgo will be run in Cascade Service until that service starts if ever. We left on time and plunged into the downtown tunnel. I had my first meal ever in the Talgo restaurant car of a children's plate of pancakes and sausage as I was not all that hungry after all the great food on the Starlight. Mt. Olympus was visible prior to our station stop at Everett after which they showed Tea with Mussolini which I saw on my last northbound trip so I listened to my music and enjoyed the views the rest of the way to Vancouver. Upon entering Canada and nearing New Westminster we were delayed by a slow moving freight train for about twenty minutes. Once across the Fraser River I took note of the construction of the new Skytrain line. I detrained and passed through Customs with just one question being asked. Speaking of transit, I learned that there is a bus strike going on when I had arrived at Pacific Central Station so when I boarded the Skytrain for my Day's Inn all the machines must have been union friendly as they would not accept any money so I received a free ride. Why is it every time I come to Vancouver someone is always on strike! My luck continued at the Day's Inn where due to a slight problem in checking me in they upgraded me into a suite. I spent a relax full rest of the day preparing for my next day's trip. My trip to reclaim the southern end of the BC Rail for my sobriety started with a 5:15 wake up call and a $15c cab ride over the Lion Gates Bridge to the BC Rail Station in North Vancouver. This was the trackage that I had tried to do on that Prince Rupert Trip but did not get to do because of that BC Rail strike last December so I am trying it again. I am doing all this for the three drinks I had with that young lady on the southbound trip during Expo 86 on my first train ride in Canada. The taxi got me there in plenty of time to walk by the steam shops and down towards the engine terminal. 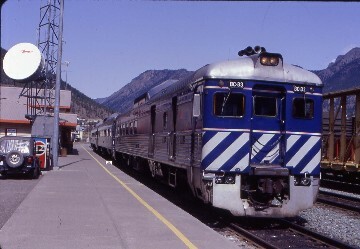 I boarded the fourth RDC for my trip to Lillooet on Easter Sunday 2001 and sat down ready for departure. We left North Vancouver right on time passing through the BC Rail yards then under the Lions Gate Bridge. As we passed by the many homes of West Vancouver my memory kicks in and I started to remember where things were before we reached them. I am always amazed how good my memory is! The RDC's do not have their dutch doors anymore so my photography will be restricted to through the window pane. It does not even bother me as I had documented this line to my total satisfaction back in 1986. 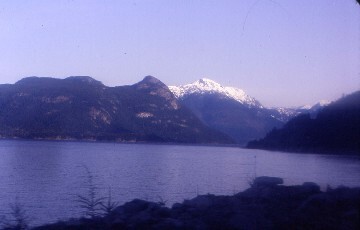 I enjoyed the trip along the Howe Sound to Squamish with a breakfast of cereal before we started to climb the Coast Range. The Cheakamus River Canyon was as spectacular as I remembered it and I shot another picture of Brandywine Falls. At Whistler most of the train detrained for a day here while others were on ski vacations. 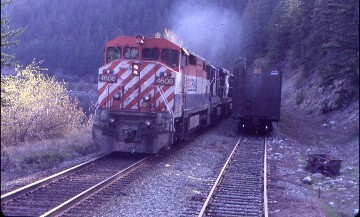 We departed Whistler on time and lined ourselves into Mons for a meet with a southbound freight train. We descended to Pemberton crossing the Lillooet River with a great view of Mt Currie. 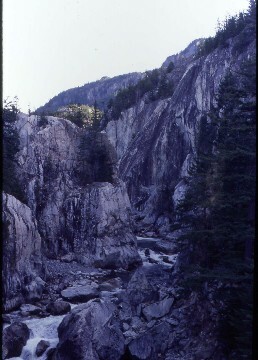 We followed the Birkenhead River towards the top of the grade before we dropped along the Gates and Darcy Rivers to the shore of Anderson Lake which we ran along the shoreline for sixteen miles to Seton Portage. We picked up a few more flag stop passengers before running along the west shore of Seton Lake. 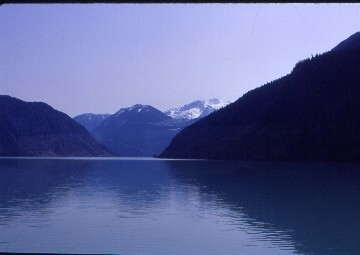 The two lakes once were one during glacial times until a major landslide came down at Seton Portage and created the portage itself. Seton Lake color is a darken green and is different from any other lake on the whole BC Rail. As we pulled into Lillooet there was a fire burning below the grade along the river and we arrived in town thirty minutes late with me having reclaimed the BC Rail for my sobriety. What a beautiful sunny April day it was as I detrained to start photographing the train. When I finished, I walked up the short hill to a hotel and had a french dip sandwich with fries. Back at the station, I bought the Route of the Cariboo book by Adolph Hungry Wolf prior to working on my sun tan. The time past much too quickly as boarding time for my southbound train came and the crew put me in the lead RDC so I could take pictures of any meets that our train had along the way south back to North Vancouver. I was looking at my new book as the train left town. We met a northbound freight at the south end of the Lillooet yard and avoided deer along Seton Lake as well as passing some llamas that had been roped up along the cliff. Further south along Anderson Lake we met another northbound freight. After sitting on the bottom of the cliff side of the train, I was amazed by all the creative ways that chicken wire had been used in track side maintenance against slides and falling rocks. I also noted there is a depression along the tracks to catch any falling rocks keeping them off the tracks. Add to all this that BC Rail runs a hi rail vehicle in front of all trains year round you get to realize how BC Rail manages to operate the trains through this difficult terrain. The Prospector continued south after losing time with each of its meets. We ran straight to Pemberton and made the climb up to Whistler. The turkey dinner I had was the all time worst meal that I ever had on a train. Next time I will pack my own meal. The Cheakamus River Canyon easily made up for the poor dinner selection and I thoroughly enjoyed it in the last light of the day. We headed into the siding at Cheakamus for another northbound freight as business must be booming on the BC Rail. We made it to Squamish and Howe Sound in the last of the twilight of the day with the lights of Woodfibre shining brightly across the sound. The rest of the trip to the big city lights of Vancouver would be in the dark. We went into the hole at Horseshoe Bay for yet another freight before we arrived in North Vancouver. I was first off and into a cab back over the Lion Gates Bridge to the Day's Inn and after a call to my mother I was off into dreamland, all within twenty minutes of arrival. Sleeping in late by my standards, I had breakfast, did a little Skytrain riding and bought a ticket to the NHL playoff game. That night at the GM Palace I went to my first ever NHL playoff game with the Colorado Avalanche defeating the Vancouver Canucks 4-3 in overtime with Colorado scoring the winning goal with too many men on the ice. That was two players too many. I had a great seat with a great view of the entire ice surface for my first Stanley Cup Playoff game. It had been a great day but I knew in my heart that tomorrow would be even better!